(Nanowerk News) Although crystal structure determination by means of X-ray diffraction has had a huge scientific impact over the last 100 years, it still requires the solution of the crystallographic phase problem. This problem arises because although the intensities of the diffracted X-rays can be measured, direct measurement of their relative phases is still only rarely practicable. Small-molecule crystal structures are usually solved by the use of probability relationships involving the phases of the stronger reflections, i.e. direct methods, or more recently by Fourier transform methods such as charge flipping. SHELX is a system of nine programs for the solution and refinement of crystal structures against X-ray and neutron diffraction data. The first version of SHELX was written around 1970 and officially released in 1976. Using data compression written specially for the purpose, it proved possible to pack the 5000 lines of FORTRAN, five test data sets and a little FORTRAN program to unpack the rest, into one box of 2000 punched cards. This greatly facilitated its distribution by post (email, internet etc. had not yet been invented) and enabled the program to spread around the world. The current version of SHELX has about 9000 registered users in about 90 countries and may be obained, together with documentation and tutorials etc., via the SHELX homepage. In 2008 Sheldrick published a review paper [Sheldrick, Acta Cryst. (2008), A64, 112-122] about the system, noting that it might serve as a general literature citation whenever any of the SHELX programs were used. The paper has since received no fewer than 38,000 citations making it the highest-ranked paper published in the last two decades, according to a recent study that appeared in Nature [Van Noorden et al. Nature, (2014), 514, 505-553]. 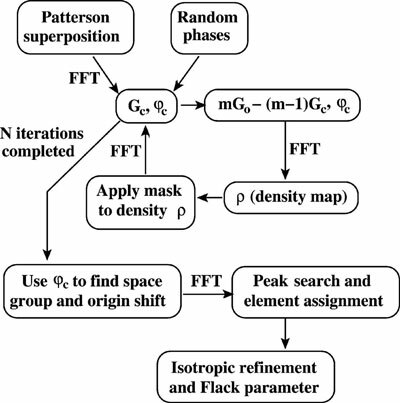 This latest addition to the SHELX program ("SHELXT - Integrated space-group and crystal-structure determination") employs a novel dual-space algorithm to solve the phase problem for single-crystal reflection data expanded to the space group P1. Missing data are taken into account and the resolution extended if necessary. In testing, SHELXT has already solved many thousands of structures with a high success rate. A recent upgrade to the SHELXL refinement program is also available ("Crystal structure refinement with SHELXL"). In a recent interview for the IUCr the author, commenting on why he thought the SHELX programs are so well received, said, "the programs are extremely robust and adopt a strict 'zero dependencies' philosophy, i.e. no third-party libraries, DLLs, environment variables etc. are required to run them".